← Seeing beyond Sight – Photographs by blind teenagers. 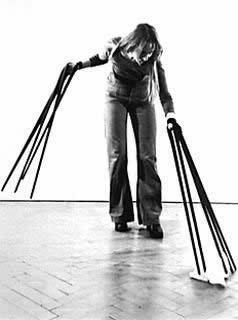 German contemporary performance artist and filmmaker Rebecca Horn, performing her “Finger Gloves” in 1972. The image below shows her performance piece in which she wears long balsa extensions on her fingers, an example of her body-extension creations, which play with ideas of touch, sensation, protection, and imperfection. They are worn like gloves, but the finger form extends with balsa wood and cloth. By being able to see what she was touching and the way in which she was touching it, it felt as if her fingers were extended and in her mind the illusion was created that she was actually touching what the extensions were touching. Working with fiberglass without a mask before, had landed her with a serious lung disease, so she was hospitalized for a year for treatment and recovery. During her time in the sanatorium, she drew, and sewed, and tried to create objects that would extend her body from the hospital bed. Another similar piece of hers is part of her Berlin Exercises series (1974) called “touching the walls with both hands simultaneously”. This piece includes more finger extension gloves, however this time measured so that they specifically fit the selected space. If the chosen participant stood in the middle of the room, they could exactly touch opposing walls simultaneously. This entry was posted in art, body modification, performance. Bookmark the permalink.